There have been mysterious purple boxes popping up in trees all throughout Vermont. Charlie Nardozzi has some silly ideas about what they could be, and then explains what they really are. Tune in Friday afternoon and Saturday morning for the Vermont Garden Journal. I’m Charlie Nardozzi and this is the Vermont Garden Journal. Hey, has there been a run on purple box kites? Am I missing the latest hobby trend? Nope, those purple boxes hanging in trees throughout Vermont have a more important role to play. They’re insect traps. The emerald ash borer is a bright metallic green, 1/2-inch long Asian insect that invaded our shores in 2002, probably as a hitch hiker on some wooden packing boxes. It has been causing a path of destruction to ash trees killing millions of these hardwoods over a 15 state, 2 Canadian province region. Now it’s knocking on Vermont’s door. It’s been spotted close by in New York and Canada. The borer only attacks ash trees, but since Vermont’s forest is composed of up 15 per cent ash, it could be a major environmental and visual blow to our state. It’s the larval form of the insect that causes the most destruction. It bores into the wood in summer and creates S-shaped tunnels, eventually killing the tree. So, back the purple boxes. State and federal agencies are trying to detect if and when the borer gets into Vermont. The purple boxes are baited with lures and checked regularly. They only attract ash borers in the immediate area so won’t lure them in from other states. This will give state officials a leg up on any infestation before it gets established. We can help, too. 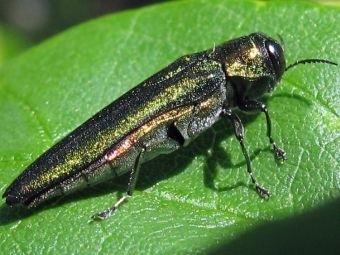 Emerald ash borer mostly is being spread around the country on firewood. Don’t bring firewood in from other states — use local wood. The purple traps will be taken down in fall, but will probably be back next year. It’s another reminder of how interconnected the world is and how insects and diseases can spread so readily affecting our lives. Now for this week’s tip, what to do with an overgrown zucchini. Here you go. Try stuffing and baking them, shredding and freezing them, use them as bowling pins or hollow them out as canoes and go for a paddle. Next week on the Vermont Garden Journal, I’ll be talking about edible flowers. For now, I’ll be seeing you in the garden!